What would happen if you took a pancake (any size you want) and doubled it over and over again so you had 2, 4, 8, etc. of them? How many times would you need to double it to fill a swimming pool? The entire earth? The ENTIRE UNIVERSE? Here you can do just that! I wrote this for my son Gilbert (at 8-years old), as a comprehensive way to answer his question of "How many times would I need to double the number of pancakes on my plate to fill the entire universe?" I figured, I'm a software developer, I could write a web application for him to do that! I have tried to make it a lesson on understanding the relative scale of items—with a pool, planet Earth, and the entire universe as good items for comparison. And also with how to calculate volumes in general, and understand the power of doubling things. As it turns out, this is an amazingly good way of understanding scale and the power of exponential growth. I print out all the numbers fully rather than in scientific notation, to make it more accessible. If the pancake is 0.25 inches high (thick), then the volume would be 0.25 * 28.274333882308138 = 7.0685834705770345109954 cubic inches. There are 1,760 yards in a mile. There are 46,656 cubic inches in a cubic yard. There are 5,451,776,000 cubic yards in a cubic mile. The volume of the earth is 260 billion cubic miles. Volume is 2,500 cubic meters (660,000 gallons) = 3,269.877 cubic yards. The radius of the universe is believed to be 46.5 billion light years. There are 203,200,000,000,000,000,000,000,000,000,000,000,000 (2.032e+38) cubic miles in a cubic light year. Volume of the universe is 85,579,781,157,884,580,000,000,000,000,000,000,000,000,000 (8.557978115788458e43) cubic miles. 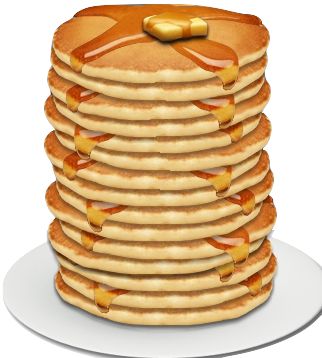 After doubling 25 timess, the stack of pancakes now has more volume than an Olympic sized swimming pool! After doubling 83 timess, the stack of pancakes now has more volume than the entire planet Earth! After doubling 191 timess, the stack of pancakes now has more volume than the entire universe! All contents of this site are Copyright ©2019 by Christopher Komuves. Please email any comments, complaints, suggestions, inquiries, etc to Chris Komuves.